Having planted the Gewurztraminer on the cooler west side of the Heimbourg calcareous hillside, we knew we took a certain risk to see some years the flowering being affected by colder winds. This is what happened in 2010 and it explains the very small crop. Nevertheless, being forced to ripen slower has many merits. Gewurztraminer grape variety develops strong terpenic aromatics (floral aromas) that can be considered as vulgar if overpowering and also quite volatile as they don’t last in the wine. Forcing this grape to take its time means that the resulting wines are more complex, less floral but spicier, and also more stable in time. 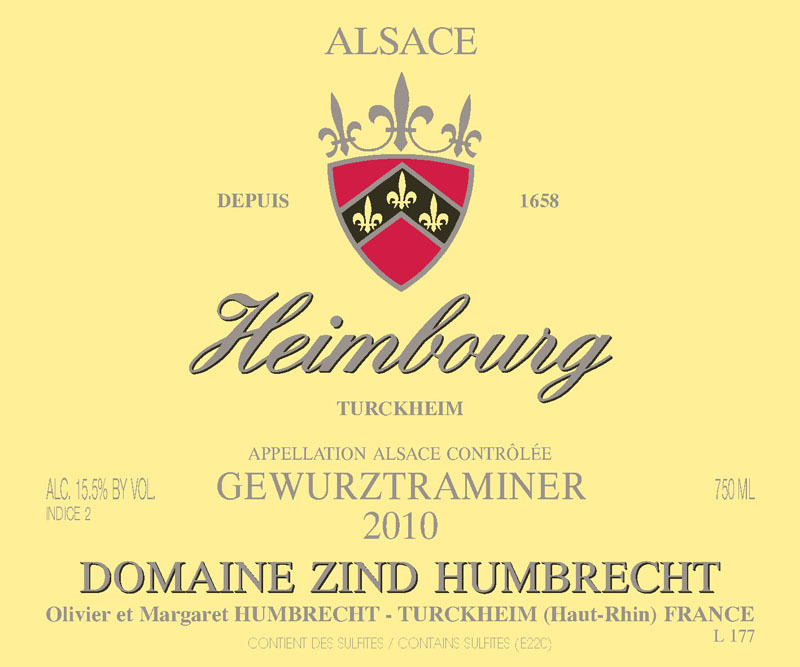 The Heimbourg 2010 was harvested quite healthy, so the grapes reached a high ripeness from natural physiology and low yields. The fermentation lasted over a year and went quite far, producing a powerful wine. 3/2012: the nose is typical of limestone: lots of spices, bacon, smoke and minerals. This is quite an austere Heimbourg, but quite intriguing and complex. The palate shows great structure and density. This is a compact wine, hiding to perfection its rich composition. The firm but harmonious palate makes this wine a very good food companion. Of course, the power has to be matched with spiciness and flavour intensity as well! It will also probably need some time to completely open up.